Just Playing around with a little curved piecing. Just look at all the colours I have to choose from. I think I can I think I can, aw...I can't. I'm sewing as I pack and thought just maybe I could finish but not quite. Since it's going to be a wall hanging....I need a quick way to cover all those seams. Now to do a facing type binding....I didn't want a regular binding on this piece. A little stay stitching....just like when sewing facings in dress making. Look at all the leftovers...just what can I do with those??? I'm being featured today on The Needle and Thread Network today. Since blog buttons and I don't get along.....you can check it out right here. And once again, to the Needle and Thread Network itself, thank you for thinking of me. A different way of joining?? ?......Just maybe. Back at the Coast....with my Janome under my arm. After flying home, with my new Janome (Quilt Con).....I quickly packed her back up (I couldn't resist unpacking her) and flew to the West Coast. And there she sits, I can't wait to fire her up. Funny, how I can turn my neatly organized studio into a complete mess by making one small change...Okay, Okay, not really so small. Back tracking....there she sits amonst my mess on the floor....I decided to pop out and buy a table I could sink her into (thanks for that idea, Leanne). So wonderful, but where do I put that? We also exchanged the sofa bed for a Murphy Bed....so much more comfortable. My husband took care of all that while I was in Austin....so, more organization required. Hmm, so where does the Pfaff go now? I make myself crazy, as I move everything around dozens of times, in dozens of combinations. Traffic flow....really don't want to trip the man as he gets out of bed, so that means moving my cute little book case (darn). As I was buying the table for the Janome.....look what they handed me. Guess where I'm going on Friday?? Hmm...maybe there are some fellow bloggers, I can connect with. So very vibrant and exciting...... 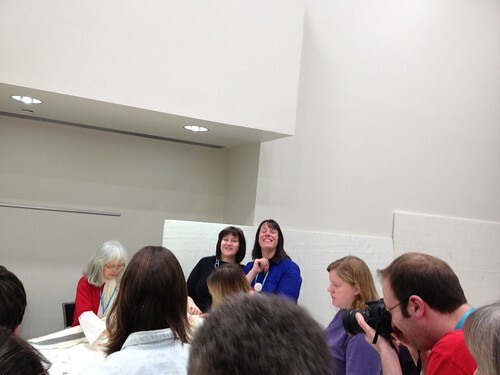 I was not prepared and even a little nervous about meeting fellow bloggers and quilters.....I need not have been. I don't believe I ate a single lunch alone.....the "come and join us" atmosphere permeated the event. The discussions were lively and thought provoking. Meeting so many of you was definitely a highlight for me. Let me share a little more about my fabulous time in photos. Note the quilterly decor in the Convention Centre....how appropriate. Starting off with a good laugh....this was in our goody bags we received at registration. There's Leanne hiding behind her bag. Hanging out with Chawne....how wonderful. I spent some fabulous, quality time with Beth and Chawne...unfortunately I didn't get Beth's photo. You know, too busy talking. Always fun chatting with Cheryl.... I discovered, not only do we live the same province, but she actually grew up, in the same small city, that I have lived in for the past thirty some years. Leanne and Cheryl in awe of Yoshiko's work....but there's always time for a photo shoot. Meeting Jacquie was definitely a highlight for me.....She is so warm and inviting, I felt as if I had known her for years. 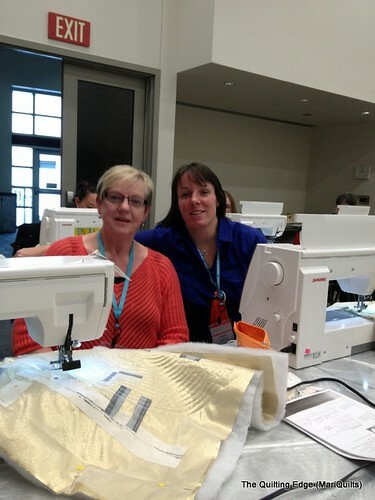 I also took a class on hand applique from Debbie, so much fun meeting her, I love her style. I ended up doing everything by machine....how lazy is that. My purse is full of cards from wonderful people I met and I plan to find some time to go through them all and hunt them down. Seriously, the connection was simply amazing. Quilt Con was an amazing experience and as I mentioned previously, there was a lot to process. I am hoping that you are not wanting the sugar coated version of my experience, but my personal, heartfelt opinion. I didn't take all that many photos of the quilts (too busy taking it all in) but here are just a few favorites of mine....so amazing to see these in real life. 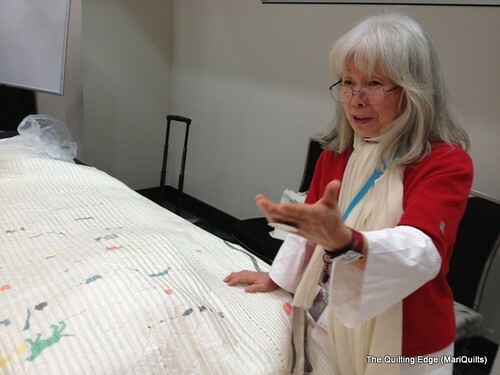 I struggled each day, as I walked through the quilt show. The quilts ranged from exquisite, powerful, playful, beautiful and amazing, to mediocre and all the way to "how did this even get in here??". The judging of the quilts was the main source of my confusion. At times, I feel they were dead on and other times I can't believe what was overlooked and what was chosen. The juried quilts and the quilts for exhibit were mixed together contributing to the confusion...especially if one is not familiar with some of the more well known quilters and their work. Some of the quilts just did not fit their categories all that well. One of the "buzz" words seems to be the term "Negative Space"....if you have that, you're in, even if it is not all that effectively executed. Originality did not seem to be rated of high importance. Some of the workmanship was perhaps not quite as high as I believe it should be. There was quite range of quilting...I felt some were under-quilted and I actually felt some were over quilted giving them a very ornate look. Of course, many were beautifully quilted and some were just plain poorly quilted. Many were more traditional than I expected. Some were powerful and thought provoking. Some were a little controversial...making me think, if we can be that way in our quilting perhaps we can be that way in our blogging. 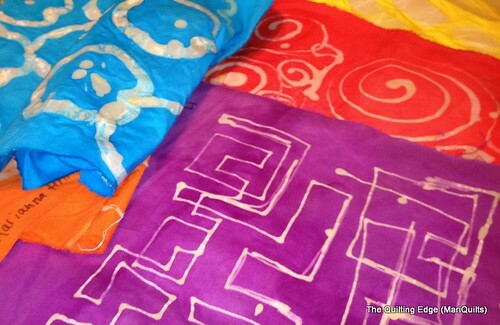 More on the classes, the lectures and the wonderful fellow quilters to come.